Welcome to the Royal New Zealand Institute of Horticulture (Inc) (RNZIH) Home Page! The RNZIH is an organisation rich in heritage and supports the most popular recreational activity in New Zealand  horticulture and gardening. Our mission continues to 'Encourage and improve horticulture in New Zealand by promoting the understanding, appreciation, conservation and use of plants'. Membership appeals to people from all walks of life. Professional horticulturists to keen gardeners will benefit from the quality of information and access to knowledge offered by the Institute. Please visit our Horticulture Pages for more information, including: Image Gallery, Plant Profiles, Garden Articles, Journal Articles, Book Reviews, RNZIH Publications, and Other Information. We have compiled many links to internet resources on horticulture. 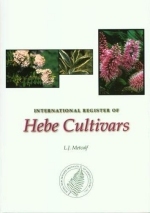 Our list includes botany and horticultural directories, New Zealand plants, Botanic Gardens and Horticultural Societies and Institutes from Australia, the UK, and the USA.